This is one of two guidebooks that replaces Walking in the Canary Islands - East. An update to the original guidebook was planned, then shelved, as the authorities in the Canary Islands embarked on an ambitious plan to signpost and waymark a splendid network of trails across the entire archipelago. Fuerteventura is renowned for its sandy beaches and surfing scene, but there are also rugged ranges of low mountains, sparsely dotted with interesting villages. Recently, many old mountain trails have been cleared of obstructions and restored for walkers, with splendid signposting and waymarking. One of the longest stretches of the island-hopping GR131 runs all the way through Fuerteventura, from Faro de Jandía to Corralejo, and also includes the tiny Isla de Lobos. From time to time along the trail, basic stone-built shelters offer relief from strong sun and winds. Lanzarote is full of volcanoes, including some of the oldest in the Canary Islands, as well as an extensive lava-covered landscape dating only from the 1730s. A splendid national park can be visited at Timanfaya, but walking opportunities there are limited. Around the rest of the island, a number of trails have been sparsely signposted and waymarked, and the island-hopping GR131 is beginning to be signposted all the way through Lanzarote, from Playa Blanca to Orzola. 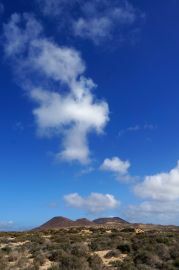 Walkers who find themselves at Orzola should catch a ferry to Isla La Graciosa and explore a fine desert island. The waymarked trails on Lanzarote and Fuerteventura offer 45 days of walking, covering 710km (440 miles). Walkers following the long-distance GR131 across all of the Canary Islands should also refer to the following guidebooks covering La Gomera and El Hierro, La Palma, Tenerife and Gran Canaria.